"As the greatest gift exacts the greatest price, the greatest accomplishment exacts the greatest sacrifice." SURVIVAL DEFENSE is dedicated to your safety and those you love. In this age of great uncertainty, rising fear and escalating tension, how much importance do you place on your personal security and that of your loved ones? Do you think you are immune from being assaulted? Raped? Being a victim? How many people who have been a victim thought it would never happen to them? After the fact, you can't go back. If you fail to prepare, you prepare to fail. Wisdom demands action. As Emily Dickenson poetically exclaimed, "It's better to be the hammer than the anvil." SURVIVAL DEFENSE will empower you with the skills and knowledge to never be the anvil . . . or the victim, but it's up to you to be pro-active, not pro-passive; to take charge of your life so you never look back . . . after the fact . . . in regret. SURVIVAL DEFENSE philosophy is that this is your life and it is your responsibility. We also believe that competence creates confidence. Our responsibility is to give you meaningful tools and knowledge to develop the confidence to keep you safe. From children to adults, families to organizations, executives to corporations, we're here to help you survive in an uncertain world where life doesn't always give second chances. 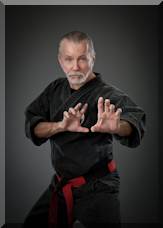 Beginning his martial arts studies in March of 1968, Richard Andrew King has a wealth of knowledge and practical skills to help you gain confidence in your ability to defend yourself with speed, power, precision and efficiency. King, having studied in both the Tracy Brothers and Ed Parker Kenpo Karate systems, holds a 5th Dan Kenpo Black Belt rating, as well as being the Founder and Grandmaster of the Karate Institute of America and the Kiado-Ryu system of martial arts in Orange County, California [est. 1979]. A graduate of San Jose State University, King is author of nine books, including The Black Belt Book of Life: Secrets of a Martial Arts Master.